Repair a Fan Switch - NGWClub®, Inc.
You might be able to repair your current fan switch by simply cleaning it with vinegar. 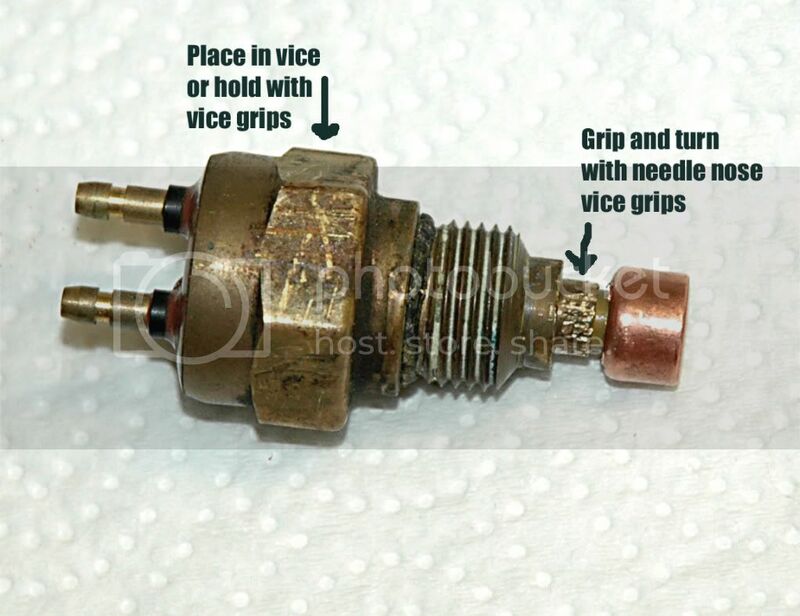 Especially in older bikes that sit, or have sat sometimes for years, the switch can become gummed up and stuck. The switch is actually three pieces and the end cap is removable. Because this part sits in the coolant it attracts the same gunk that plugs your rad. Easy step by step process - and I'll add pics below when I remember how to do it. 1. After the switch is removed from the bike it is best to soak it for a few hours in a straight vinegar bath. 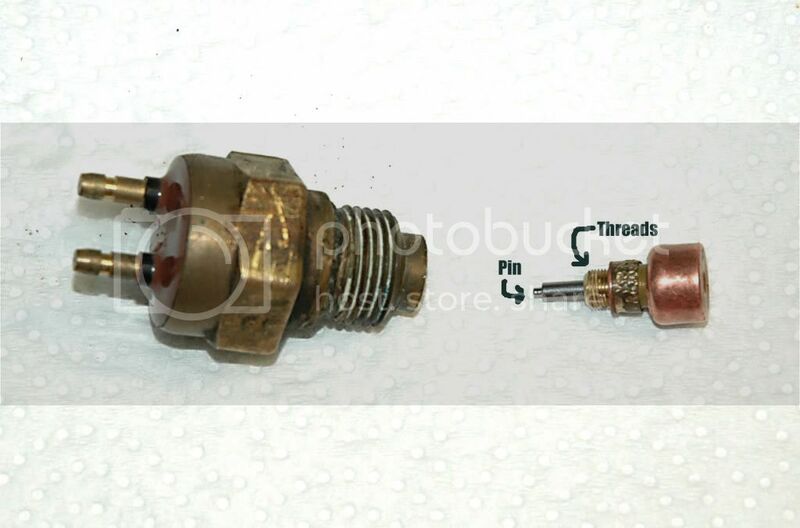 This helps break up any corrosion that has accumulated on the threads that hold the end cap. 2. Firmly grip the main body of the switch - I used a hand held pair of vice grips where the wrench would normally go. 3. DO NOT GRIP OR TURN THE END PROBE - WHICH IS THE COPPER PIECE ON THE END. 5. Grip this third section with a needle nose vice grip and turn it gently to unscrew it. It will take some effort but not much. If you are stripping metal off it like I did at first, it probably needs to soak longer. 6. Once the end piece is removed you will see a pin that is supposed to slide freely inside. 7. Soak the end piece with the pin in vinegar overnight and it should loosen enough to pull the pin out. If not, let it soak some more. 8. When the pin is removed, use your fingernail to scrape off any more residue that may be stuck on it and clean out the hole where it sits. I used a toothpick and vinegar bath. 9. Once clean, the pin should slide very easily in and out of the hole. 11. Test, or not, to suit but should probably test as this will only work if the switch is broken because the pin is stuck. Hope the pics attached ok. If not I will add them again later. Last edited by Mark King on Tue Aug 23, 2011 3:40 pm, edited 1 time in total. I'll be dad-gummed! That is a fine little tutorial, thanks bunches! Worth trying on the old one (which never got thrown out, of course). Having some trouble on this very thing and I'm a long way from home. Does any one have part numbers for the automotive ones that fit? roady did the research for this, i didnt see it here in this list so here is the link to his post. octane posted the interchange list and it will fit a bunch of gl's. Doing the vinegar soak in combination with an ultrasonic cleaner may speed up the process. 1985 LTD (SOLD) To support my naked obsession!! I don't want a nickel, just want to ride my motorcycle! I just did this on a friends bike & it was a FIX! I know this is an old thread, but I wanted to thank Mark for this tutorial. I picked up a '79 about a month ago and noticed that the PO hand installed a switch to active the radiator fan. I followed the excellent directions and the switch works great now. Thanks again...now onto rebuilding the carbs. Great write up. I had a little trouble finding the right set of pliers to grip the part tight enough to break it loose. No needle nose vise grips to use so let's improvise. I scarred the thing up slightly with a few pairs of needle nose pliers and she would not budge. Looked around for something better and found a set of cheapo wire crimp/strippers that were actually the hot ticket for this. The screw driver is pointing at the part I used and is partially covering the marking saying "ignition terminals"
As of now it's all soaking in vinegar. If I'd have tried them 1st I might not have scarred the part up as much. I didn't hurt it with the other pliers. If you are doing this job and have those handy they work really well for this application.